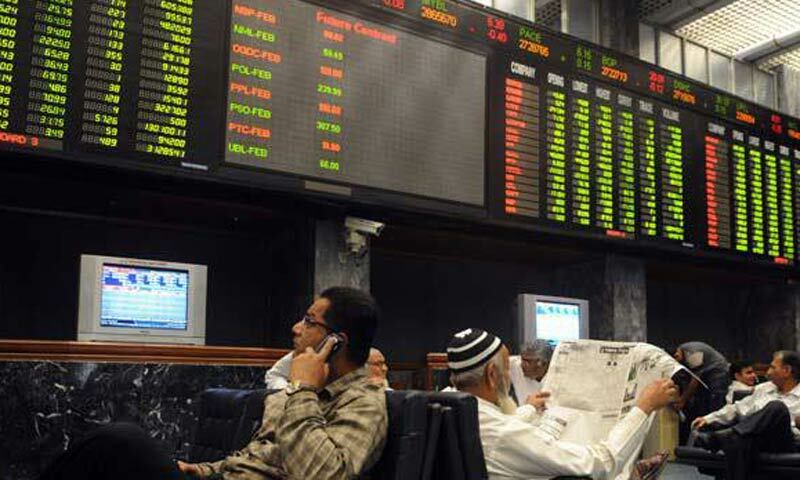 KARACHI: The two-session last day of the trading week on Friday saw the stock market put up a dull performance with the KSE-100 index closing almost flat, in the red by 14.55 points to 23,673.30. The sharp volatility was again the feature of trading with the index moving between the high and low of 23,819.93 and 23,625.76 points. The major financial result unveiled on Friday was of MCB Bank, which posted earnings per share at Rs6.05, up 6 per cent QoQ in 2Q2013. After the surprising huge net purchases of $8.1 million worth equity on Thursday, the foreign fund managers were quiet on Friday with minor inflow of $0.08m. Yet the banks bought shares worth $2.89m and companies $1.37m on Friday. Individuals and mutual funds decided to take profit, offloading stocks valued at $0.22 and $2.35m, respectively. Samar Iqbal at Topline Securities pointed out that the index heavy weight OGDC and MCB which were on the rise in the last few sessions saw some profit taking on Friday. NBP, however witnessed healthy volumes on institutional support. Dealers on the sales desk at Sherman Securities stated that oil stocks like OGDC, PSO and POL closed in the negative zone. OGDC was down 1.3pc PSO declined by 0.4pc and POL lost 1.4pc. PPL remained firm as the company results are to be announced the coming week. Among other heavyweights, PPL closed up 0.3pc, while MCB was down 2pc after the results were announced. A dealer at AHL Equity Sales observed that the Rupee remained under pressure and closed Thursday at Rs102.74 in interbank. Yet the foreign buyers on Thursday had purchased net $8.1m worth Pakistan stocks. : "It is a bit ironic that regardless of the weakening rupee foreign flows have remained unhurt and instead increased,� the dealer said. The newsflow on Friday included: SBP providing figures of foreign exchange reserves for the week ended Aug 7, which showed Improvement by $96m to $10.326 billion; earlier on Aug 2, the forex reserves stood at $10.230bn. Automobile sales data showed increase in sales of car, buses, in July though sales of commercial vehicles, trucks and tractors declined. Moreover, the Russian government on Thursday expressed its interest to invest in Pakistan�s energy sector, especially in the implementation of 500 to 600 megawatts of coal-fired power plants near Muzaffargarh and Jamshoro and also modernisation and conversion to coal of some other power projects in the country. Also on Thursday, the Economic Co-ordination Committee (ECC) of the Cabinet discussed the modalities for the provision of subsidy on fertiliser to farmers in view of likely damage to crops by the recent heavy rains.Among the 356 issues that came up for trading on Friday, gainers at 175 were shortly ahead of the losers at 163. Volumes fell by 19pc to 153m shares. The commercial Banks contributed nearly 31pc to the overall turnover with 6.5pc share by NBP. Trading value fell to Rs7.694bn, from Rs9.231bn. Market capitalisation was shaved off by Rs5bn to Rs5.829 trillion. The volume leader for the day was Bank of Punjab with 15m shares, down 31 paisa to Rs13.69; NBP was up by 57 paisa to Rs58.06 on 10m shares; JS Investments lower by 81 paisa to Rs9.45 on 8m shares; Fauji Cement on 8m shares, shed 2 paisa to Rs15.35, while Engro Corporation jumped by Rs1.60 to Rs151.62 on 6m shares. The other fertiliser company Dawood Hercules fared even better by hitting the �upper circuit� with gain of Rs2.73 to close at Rs59.04 on 5m shares.